Our beloved Krups coffee grinder had died, and the sound of the beans smashing at light speed against the plastic prep bowl in our mini food processor would wake the dead, or at least our house guests on a different floor. Thus we found ourselves in the market for a new coffee grinder. 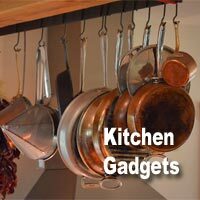 Here’s the summary of my digging into what Cooks Illustrated, Consumer Reports product reviews, the Amazon reviewer community, and a handful of other online gurus had to say about the blessed bean and how best to grind ‘er. Even grind = better extraction = “Ahh… that’s lovely!” coffee. Using even a cheap half-decent grinder at home just before you make your coffee trumps using the big ol’ supermarket monster grinder at the Piggly Wiggly the day before. Heat creation: good quality burr grinders are reputed to create less heat during the grinding process than the blade jobbers. Ease of cleaning counts as the race against the clock is already lost if you wake up to yesterday’s leftovers in your grinder. And in my world, the easier something is to clean, the more likely it is that it will become the habit it should be. Cost: Spending less money to achieve similar results is better. Reliability: A grinder that’s in a shipping container on its way back to the manufacturer for repair won’t make very good coffee, no matter how much you paid for it in the first place. Noise: It should be the aroma of the elixir, not the supersonic squeal of the grinder, that coaxes your beloved from their slumber. 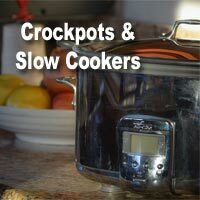 With that background in mind, we visited our usual suspects–Cook’s and Consumer Reports–for their recommendations, only to learn that they were surprisingly tough to come by. An online search of Cook’s Illustrated produced only one disappointing review on coffee grinders dating back to 2001 (the date is obviously problematic) and even that only reviewed grinders under $50. Their highest recommendation back then is still available, the Capresso 501 Cool Grind blade grinder, above. A newer model is now available, except that now it’s called Capresso 501 Cool Grind Coffee/Spice Grinder. Given the conventional wisdom that uniformity is a top consideration, why would their top recommendation be a blade grinder? 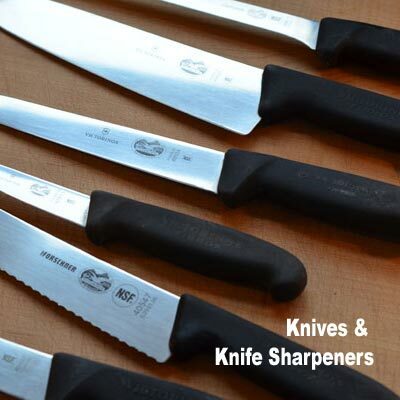 In their article, Cook’s claims that their tests didn’t reveal a huge difference in temperature between the blade models and the few low-end burr grinders they tested, and that by giving a blade grinder a good shake as it’s grinding, the uniformity issue of the grind can be resolved, so maybe an inexpensive blade grinder is indeed an okay option for an average coffee drinker. , it’s an underwhelming consideration. So if you just want a decent, reasonably reliable home grinder, according to a 13-year old review by Cooks Illustrated and around 3000 informed consumers, you get a lot of bang for your buzz with the Krups. Just be sure to pick it up and make like a martini master to even out the grind, and you’ll be 4.4 / 5.0 the way to a great cup of coffee. Incidentally, Consumer Reports’ more recent review talks about exactly one model that grinds coffee, and it isn’t even an actual stand-alone coffee grinder. What part of the brave new world vision of “a Starbucks on every corner” have these people missed? The biggest beef at Amazon about the Krups was, hands down, around reliability, and at roughly $150, I’d keep shopping, which we did. 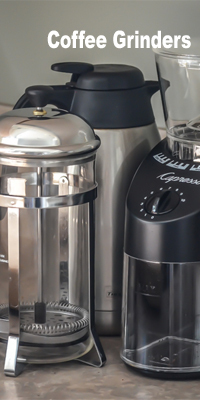 Given the disappointing results of our Cooks and Consumer Reports recommendations and the wee epiphany that perhaps current users of coffee grinders might have insight into something Cook’s Illustrated and Consumer Report’s have lost interest in, we decided to try a new approach to find the best conical burr grinder out there: the Amazon reviewer community. Yup. We crowd-reviewed our way into our new grinder. So far, we’re 98% loving it. 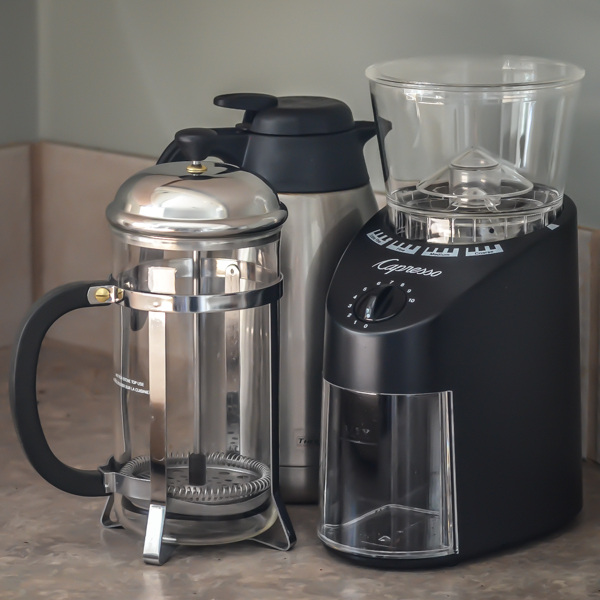 At about $100, it’s less expensive than the Baratza Encore, although the Barazta is also a well recommended unit that’s mentioned in several online guru discussions and was a strong runner-up consideration for us. It’s compact, solid with no flimsy-feeling parts, and runs virtually static free. I just tap it lightly after grinding (an old habit that was reinforced in my research), and the grinds transfer smoothly from the grinds holder to the French press with zero airborne grindlets cluttering the counter. 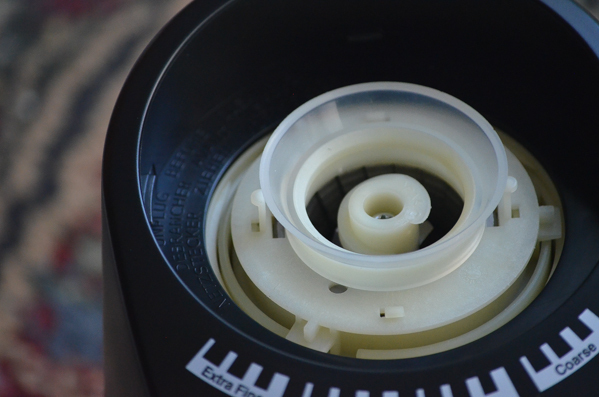 … and it’s easy to take out the upper burr to clean. 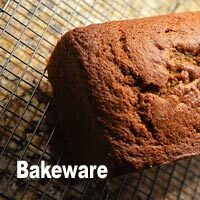 You just whip the little brush around the upper burr to loosen any clinging remnants, hold the base upside down over the sink and tap gently to dump any grounds around the bottom burr, and you’re done. The unit has a wide range of grinding options, although so far, we’ve only tried the coarse grind for use with our French press, which incidentally is the top methodology recommendation by Cooks Illustrated on how to make good coffee. Once we’ve fired up the espresso machine, I’ll weigh in on the remaining 2% of “loving it,” and I’ll be sure to check in in about 6 months to let you know if we 4.1 / 5.0 agree with the other 2,114. 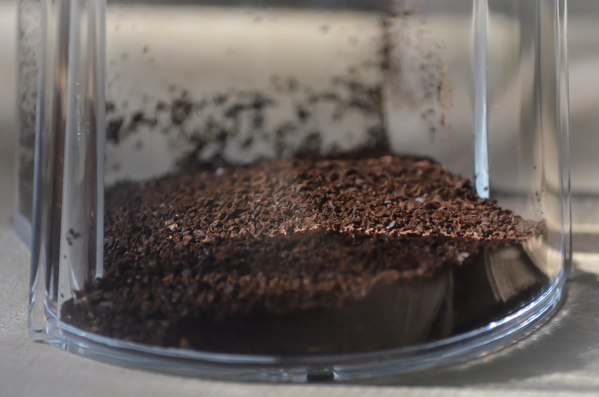 Love my Capresso – I’ve had it for 10+ years and still going strong!…but how do I deep clean it? the easy blog navigation, the relationships you make it possible to create – it’s got all extraordinary, and it is aiding our son in addition to the family consider that that theme is interesting, which is certainly extraordinarily vital. article are ultimately the most effective we have ever had. I fail to understand the value of reviews done by far away people that do not include their qualifications to determine a good or bad product. All things are subject to individual tastes and are mostly fictional in origin. The coffee bean grinder I use at home is a Rancilio Rocky. At my second home, with the woman who makes my life interesting, I have a Krups GWX212/6. Both produce good coffee when the beans are ground just before brewing. The cost of both used grinders was $80.00. Great review! I give coffee gift baskets as wedding gifts and finding an inexpensive yet reliable coffee grinder add to them has been a little over budget-until now! :)) thanks! Our coffee grinder just lost one of its blades this morning while I was grinding coffee. So now I’m on a hunt for a new coffee grinder, checked out your review and like a lot of what I read. I’m curious as to how your burr grinder held up to the cappuccino maker test? 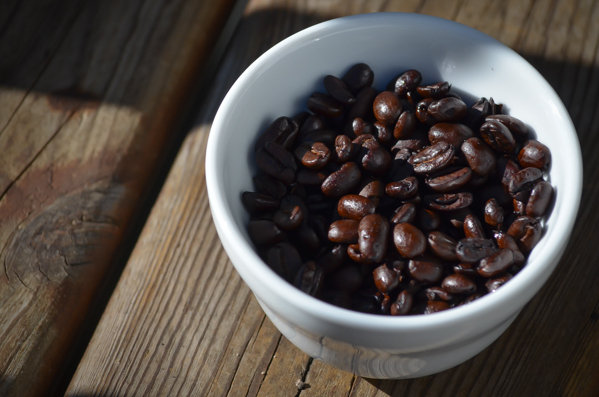 We grind our beans and use a Melitta cone style coffee filter, so we like a fine to medium grind for our coffee. Any thoughts? The burr grinder worked well in producing a fine grind for espresso, although we still use it mostly for French press grind on its coarsest setting. So far, the Capresso has turned out to be a solid workhorse: still very quiet, consistent grind, well constructed, and easy to clean. 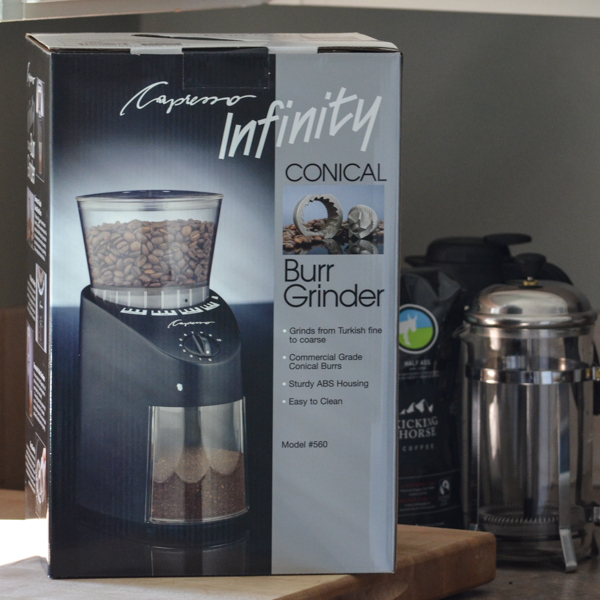 I have the Krups grinder…it’s an oldie, but a goodie!